So, apparently there was a reason why Thiago Tavares (Pictured) looked a tad more chiseled in his “UFC on FX 7” bout with Khabib Nurmagomedov. Tavares has tested positive for drostanalone and was issued a nine-month suspension retroactive to his January 19th fight date. “All 22 fighters on the UFC on FX 7 card were drug tested at the event and all fighters passed their drug tests with the exception of Thiago Tavares,” the UFC’s official statement read. “The results for Tavares showed the presence of Drostanolone, an anabolic steroid and banned substance. As the old adage goes, “Cheaters never prosper.” Tavares was quickly put to sleep in the opening round when he continued to block Nurmagomedov’s vicious elbows with his face. On a side note, don’t always trust the rumor mill. There was chatter the guilty party might have been Vitor Belfort, but “The Phenom” and UFC president Dana White emphatically denied the claim over the weekend. However, Belfort did receive a therapeutic-use exemption for testosterone replacement therapy (TRT) for his fight against Michael Bisping. UFC vice president of regulatory affairs Marc Ratner typically oversees the Octagon’s overseas events because most countries don’t have governing bodies for MMA. 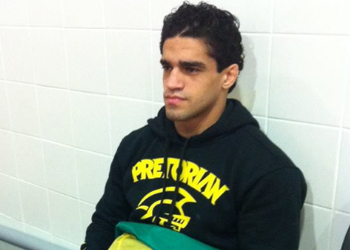 However, Comissao Atletica Brasileira de MMA sanctioned their first UFC card this time around. Tavares joins Joey Beltran, Rousimar Palhares, Thiago Silva, Dave Herman and Stephan Bonnar to fail drug exams since October. Coincidentally (or maybe not), all of these flunked screenings took place outside of the US. “UFC on FX: Belfort vs. Bisping” went down inside Ginasio do Ibirapuera in Sao Paulo, Brazil.